Illicit Cultural Property: Should Street Art Stay where it was Made? In Queens, a similar difficulty may be emerging. The owner of this warehouse space in Long Island City has announced his intention to develop the warehouse into a residential project, supermarket, and space for artists. As Marlon Bishop reports for WNYC "Since 1993, the former warehouse space in Long Island City has served as an informal training ground and gallery for street artists from around the city. 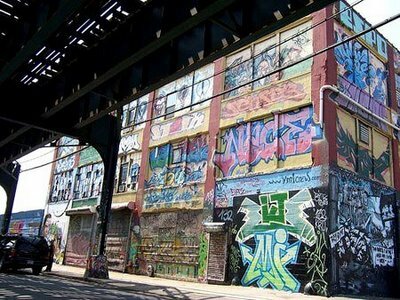 The space is regularly visited by graffiti and hip-hop fans from around the world, earning it a reputation as a street art mecca."